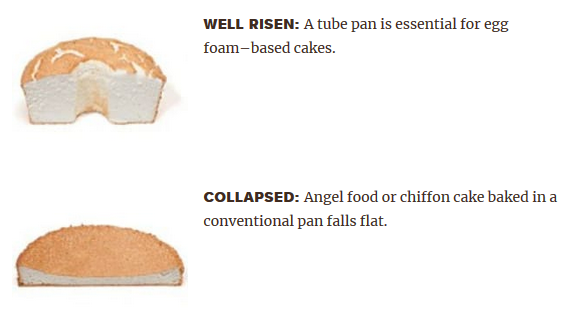 There’s a good reason angel food and chiffon cakes are always baked in tube pans, and it’s not just aesthetics. These specialty vessels actually help delicate cakes rise. Because egg foam–based cakes like angel food and chiffon contain very little flour, and therefore very little of the structure-building network called gluten, the batter needs something to cling to as it bakes, or it will collapse. Enter the tube pan’s tall sides: As the egg foam heats up, it will climb up the sides (and conical center) of the pan. the batter “clings” to the side of the pan as it rises. You will not get as much rise if it is greased. The above statements seem to be pretty common belief. However, JoePastry.com discounts them. It’s a popular myth that the center tube gives an angel food cake more surface area to “grip” as it rises. The reality is that cakes don’t “hold on” to pan sides, nor do they receive “support” from pan walls other than to simply be contained by them. For cake layers the name of the game is heat. The quicker it penetrates the mass of batter all the way through to the center, the more evenly the cake bakes. Pan walls facilitate that heat transfer, which is why batter near pan surfaces rises and sets faster than the batter that’s further away. I cannot find any other source that supports this. Does the center tube help support the Angel Food cake? Or does it just help get heat to the center of the cake? I would have posted this on cooking.se, but it already has concluded that the pan is for support. Browse other questions tagged chemistry cooking .